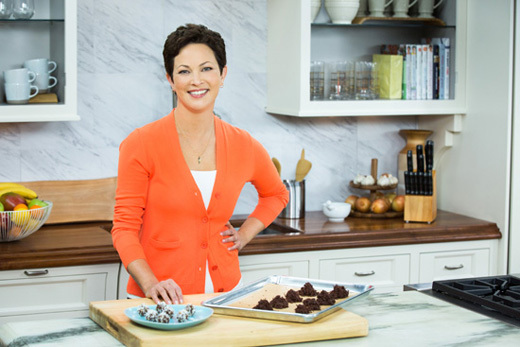 Nestled in the hustle and bustle of New York City is Ellie Krieger, RD, well known for her hit Food Network television show, Healthy Appetite. Krieger is a James Beard Foundation and International Association of Culinary Professionals award winner, and a weekly columnist for The Washington Post. She's also been a columnist for Fine Cooking, Food Network Magazine, and USA Today. This RD also speaks regularly at events around the country; appears on national television shows, such as TODAY, Good Morning America, and The Dr. Oz Show; and has been featured in magazines like Better Homes and Gardens, People, Self, and More, to name a few. Krieger has a 14-year-old daughter (who's taller than her, she confesses). Her daughter has been on many television and magazine shoots with Ellie, sometimes begrudgingly, but she mostly enjoys it. After all, it's all part of the family business. Krieger's husband runs a nature school called Urban Kid Adventurers, which she calls "the coolest job in the world, besides my job." Many things bring Krieger joy in life, including the health and happiness of her loving family. Being outside and close to nature, even in New York City, in Central Park, also provides the famed nutritionist with tremendous happiness. Good food, good music, good people, and art also give her much joy. Krieger's hobbies include yoga, spinning, and Zumba (as long as she isn't looking in the mirror). She enjoys the outdoors to kayak, hike, bike, ski, swim, or whatever the weather allows as often as possible. Museums, Broadway shows, and novels also are on her hobby list. I tried getting Krieger to tell me what her favorite dish or restaurant is, but she claims that question is absolutely impossible to answer. "The thing I love most about food is the adventure of it—I am constantly exploring new tastes and new restaurants, which is easy to do in NYC!" says Krieger, demonstrating a philosophy that exemplifies her personality and how she relays the art of nutrition. Today's Dietitian (TD): Congratulations on your new television show, Ellie's Real Good Food! What inspired you to create this? Krieger: Thank you! I love the medium of television on several levels. As a dietitian, I can inspire a vast number of people to eat better and give them realistic tools to do it. Also, I feel so at ease and at home in front of a TV camera. I am pretty sure I was born that way, based on what my mom tells me. I am especially thrilled to be on public television, which is accessible to all people regardless of whether they have cable. Its mission is so in line with mine to provide shows that both entertain and enrich people's lives. TD: You appear so calm and collected on the show. Are things really that calm behind the scenes? Krieger: I feel like part of my job as the host of the show is to keep my cool and keep the mood light and fun. So I try my best to ignore any mishaps going on around me. Mostly things go smoothly because I have an incredible team of professionals from the back kitchen to the cameramen. The biggest challenge for me is the pace. The shoot days are often 12 hours long for days on end, and it's a challenge to approach each segment with the same effervescent energy. TD: You are one of the few dietitians to break into television. How did this happen for you? After getting my undergraduate degree in clinical nutrition from Cornell I pursued a master's in nutrition education from Teachers College at Columbia University with an emphasis in journalism. I did internships at CBS in the health news department, and at CNN with the still-inspiring RDs Liz Weiss [MS, RD,] and Carolyn O'Neil [MS, RD]. Once I graduated I started pitching ideas to TV producers and magazine editors and got a lot of rejections. But a couple of small opportunities arose and eventually I landed a hosting job for a TV show where they wanted a health professional. That show, called Living Better with Ellie Krieger, was canceled after two seasons, but it helped me launch my first book, Small Changes, Big Results. A producer from Food Network saw my book and asked me to come in for a meeting, and that's what led to Healthy Appetite. Now I have six books under my belt, two regular Washington Post columns, and the new show! TD: Can you give a few tips for dietitians hoping to break into television? Krieger: Take advantage of all the new media at our disposal to hone your on-camera skills and develop your voice and your following. Pitch ideas to local news producers, and cultivate relationships with them. Once you get some experience on the local level you can pitch national shows. Be ready to get a lot of ignored e-mails and "no"s, but don't give up. Change your approach/angle if the one you're using isn't resonating. Also, don't just focus on TV. I see the media business as a real 360-degree wheel where all the spokes are important—writing for print and online, social media outreach, advocacy and volunteering, TV/video, and more. To survive in the media world you have to cultivate multiple platforms. TD: What are some tips for appearing professional and resonating with viewers when you're on television? Krieger: Have no more than three main points that you want to get across at the top of your mind so you don't get bogged down with too many details—TV segments speed by. And be very well prepared, but once you get on set, shake it off, have fun, and just roll with it. Genuinely connect with the host if you're a guest on a show. If you worry too much about being perfect, you'll come across as mechanical and not relatable. TD: Your books have inspired me and many other nutrition professionals. Your latest cookbook You Have It Made: Delicious, Healthy Do-Ahead Meals is no different and provides 150 recipes that can be prepared ahead of time, each with easy-to-follow instructions for storing and reheating. How can nutrition professionals use your latest cookbook to help clients? Krieger: As dietitians know, many people struggle to cook tasty, healthful meals for their families because their schedules are so hectic. The idea of You Have It Made is to help people get over that hurdle by cooking in advance. The book is designed to give you everything you need to turn your fridge and freezer into a treasure chest of delicious, healthful options. Something really unique about the book is that each recipe includes specific instructions for storing in the refrigerator or freezer and for thawing and/or reheating so there's no guessing involved. Besides being a beautiful book with stunning photos, I see it as an excellent nutrition education resource, because if nutrition professionals can enable people to cook more they can be more effective in helping them on their path to wellness. TD: Why do you feel it's important to provide exact portions along with the full rundown of nutrient information in every one of your recipes? Krieger: I am not an eat-by-the-numbers person, but I include a full nutrient analysis and portion size for each of my recipes because I believe it's a helpful guide and important perspective for people. Most people are out of touch with what an appropriate portion is, and my recipes can help enlighten and satisfy them healthfully. Also, the nutrient analysis can help people make decisions about food that may pertain to specific health/medical conditions. TD: Can you provide a few tips for dietitians hoping to write a cookbook? Krieger: Buckle your seatbelt! Seriously though, it's more work than most probably imagine but incredibly satisfying. When thinking about a book, make sure you consider it from a marketing point of view. Who is your audience? How can you reach them effectively to sell them the book? You really need some kind of established platform and audience to have an effective book pitch. TD: How do you balance your busy work schedule with your personal life? Krieger: I'm constantly reprioritizing. If I'm out of balance and working too much, I actually begin to feel sad and blue, so when I feel that coming on I know I need to reevaluate and change something, say no to more things, and reprioritize. Also, shutting down and breaking away from e-mail and social media in the evenings and weekends is key for me. TD: Could you share a recipe from your television show? 1. In a medium bowl, combine the Cajun seasoning, salt, and pepper. Add the shrimp and toss to coat. 2. Place eight large (10- X 18-inch) pieces of heavy-duty aluminum foil on a flat surface. 3. 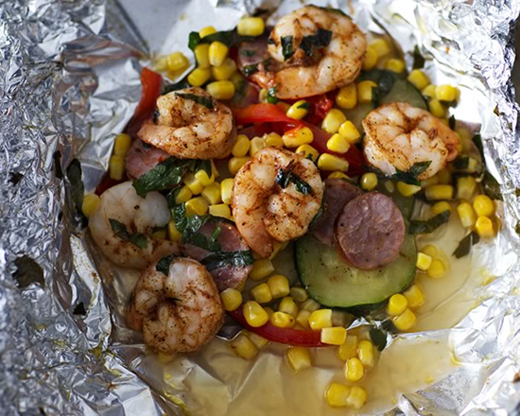 Divide the sausage, zucchini, peppers, and corn among the foil pieces, placing the vegetables in the center of each. Top each with shrimp (about five or six), sprinkle each with 1 T parsley and 1 T basil. Drizzle each with 2 T of wine and about 2 tsp olive oil. Fold each piece of the foil to form a packet, sealing tightly and leaving a little room inside for air to circulate in the packet. Packets may be refrigerated or frozen at this stage. 4. To continue, preheat oven to 425° F. Arrange the packets on a baking sheet and cook until the shrimp is cooked through and the vegetables are tender-crisp, 13 minutes. Open the packets slowly, being careful of the hot steam. Then transfer the shrimp, vegetables, and the sauce that has accumulated to individual bowls or rimmed plates. Place uncooked packets in the refrigerator, where they'll keep well for up to one day. When ready to cook, follow the "to continue" instructions above, adding about five minutes to the cook time for a total of about 18 minutes. Place uncooked packets into sealable plastic bags, keeping them level and upright. (Two packets fit well into a gallon-sized bag.) Freeze for up to two months. There's no need to thaw before cooking. Remove the frozen packets from the bags, place them on a baking tray in a cold oven and preheat along with the oven to 425° F. Once the oven comes to temperature, continue to cook for 35 to 40 minutes. Excellent source of: copper, phosphorus, protein, vitamin A, vitamin C, vitamin K, zinc. Good source of: folate, iron, magnesium, manganese, niacin, potassium, vitamin B6.